On Tuesday 17th June 2014 between 18:30 – 19:30 we’ll be hosting another free group hypnosis session. 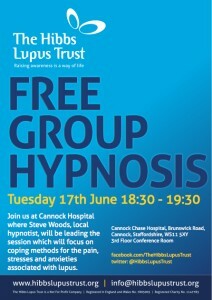 Join us at Cannock Hospital where Steve Woods, local hypnotist, will be leading the session which will focus on coping methods for the pain, stresses and anxieties associated with lupus. I just wanted to thank you for running the Lupus hypnosis sessions. I attended tonight’s session with my daughter and I know how much this means to her. She was diagnosed with Lupus in January and the flare ups have been severe and prolonged. We just hope that at some stage it will be controlled. She has found the hypnosis sessions very helpful and uses the download regularly at home.